1. Develop and implement gender-responsive standards, procedures and checklists to ensure confidentiality and proper documentation of cases. 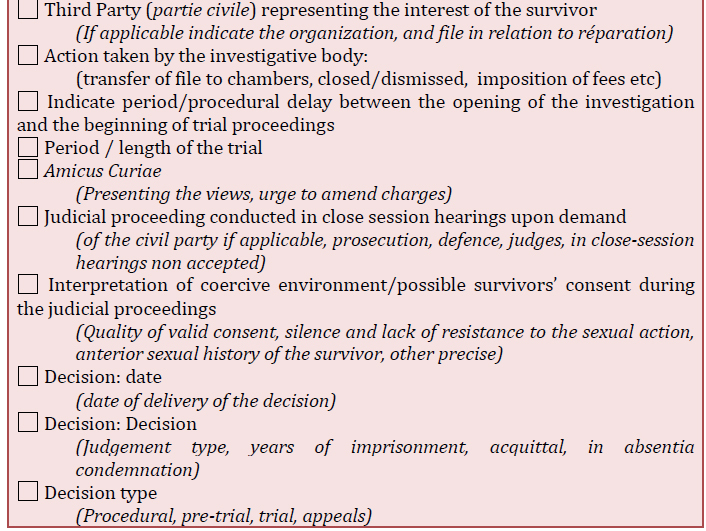 The following checklist provides a practical example on issues related to facilitating access to justice for victims of sexual violence. 2. Ensure that the response is survivor-centered and occurs in an environment that promotes the dignity of the survivor and ensures her physical and emotional safety. Support services should be made available, such as referrals, childcare support, translation and access to staff knowledgeable about and sensitized to diverse populations and VAWG issues. 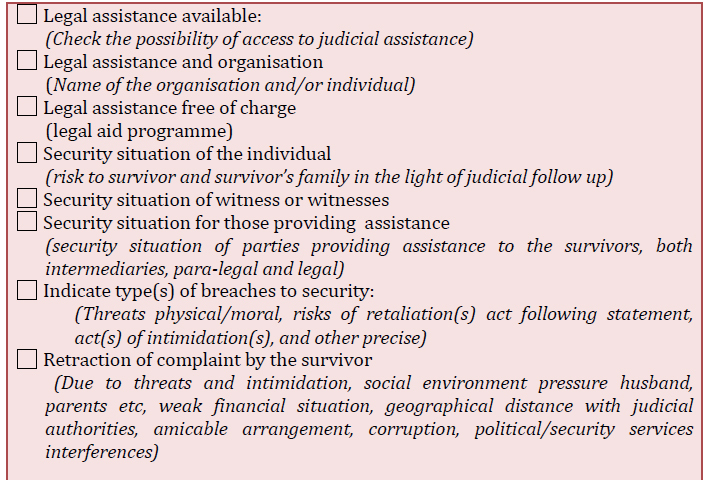 Establish and expand legal assistance programmes for women and girls order to ensure that free or low-cost legal counseling and representation is available to survivors of VAWG (for more information see Justice Module). Consider fee waivers and reductions. Review costs associated for making a claim, including both “direct” (fees that must be paid to use the justice institution such as a charge to file a case, or a bribe), and “opportunity” (the income that a person can lose bringing a case to justice) costs. Work to find innovative ways to decrease or eliminate these costs (American Bar Association, 2012). 4. 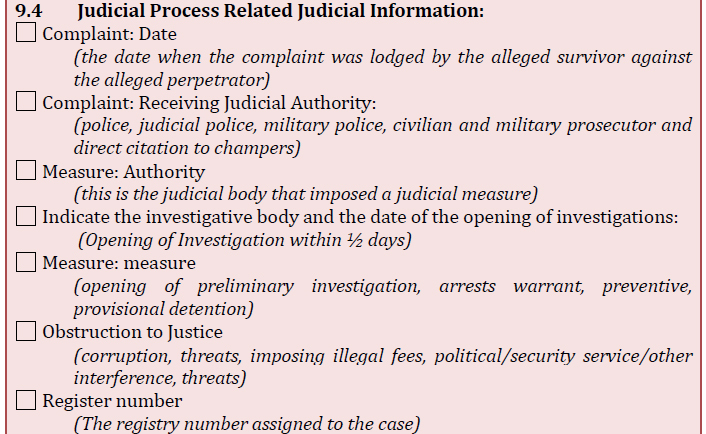 Ensure that victims of VAWG have physical access to state and non-state justice institutions. The further a victim has to travel to seek assistance, the less likely it is that they will lay a claim (American Bar Association, 2012). Ensure buildings are physically accessible to women and girls with disabilities (Human Rights Watch, 2012). Consider specialized courts for violence against women and girls. Use civic education programs to combat fear of public institutions and negative attitudes. Support court accompaniment programmes involving trained advocates to assist victims in accessing courts and understanding rules and procedures. Address other issues that might impact accessibility include the transportation infrastructure, insecurity and restrictions on travel, and the threatening nature of the legal/justice system (American Bar Association, 2012). 5. Work to improve the timely resolution of cases. Support efforts to lower caseloads and improved case management procedures (American Bar Association, 2012). Increase training of and use of paralegal personnel to assist victims. (See Service delivery and access). 6. Increase community mobilization in defense of women’s rights. Strengthen non-state justice mechanisms and community-based alternative resolution, where appropriate. Example: Care International in Eritrea. In 2001, Care International and Haben, a local NGO, developed a GBV prevention and response programme in two rural areas of the country: Gashbarka and Senafe. In Senafe, the programme targets war-affected populations which either fled conflict or remained in enemy-occupied territories during the recent war. In Gashbarka, the programme targets returnees from Sudan most of who are moving into newly established villages in remote areas. Currently, the project focuses on communities in Gashbarka, bringing the National Union of Eritrean Youth and Students (NUEYS) into the partnership. Using a multi-sectoral, community-based approach, the project raises community awareness on gender-based violence, increases community knowledge of human rights, particularly women’s understanding of their rights, and contributes to the sustainable development of appropriate responses for survivors of gender-based violence Source: excerpted from Raising Voices and Safer Cities Programme, 2004, pg. 24. Establishing paralegal units in the camps and training refugee paralegals to provide free legal aid services to survivors of violence. Provision of legal and human rights education for refugees via dissemination of educational materials, use of drama and folk music, and radio programmes on refugee rights with information on where and how to access justice. Roundtable discussions with community leaders. Building the capacity of law enforcers to respond to violence against women and girls including police, immigration officers, social welfare and community development officers, magistrates and camp settlement officers. Working with a refugee police force, elected by refugees. WLAC trained refugee police in Tanzanian law and women’s rights, and linked them up with paralegals who provided legal advice and support. Working with host communities to encourage them to respect the rights of refugees. Refugee communities have become vigilant on violence against women and girls issues and rally behind women who seek justice after experiencing violence. Community leaders and others in the community accompany women to report violence and are no longer ashamed to associate with them. Camp Leaders and Local Tribunal members who administer customary laws in the camps now refer violence against women and girls cases to the police, WLAC or paralegals rather than handling them themselves. Refugees, particularly women and girls, have more knowledge about their rights and are accessing them. There has been an increase in the number of cases reported to the police –from a negligible number prior to 2008, to 400-500 cases a year by 2011. 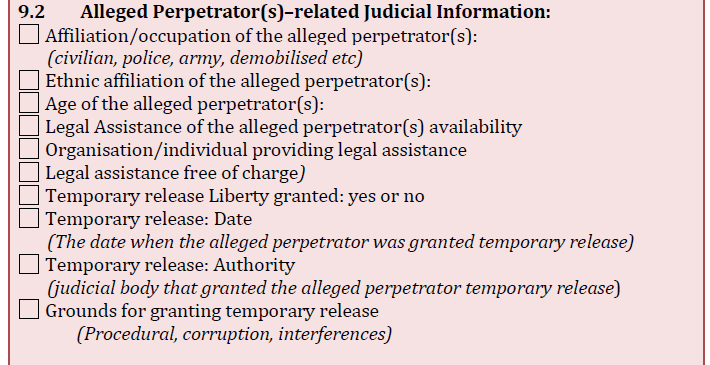 (adapted from DFID, 2012, pgs. 24-25).